So I decided to check and see if the current format used to get RSS Feeds for all user data would also work to specifically get Comments & Likes for users. As you can see below, it sure enough did. Looks like I found another un-documented feature. Sure it’s an ugly hack, but until they offer what Dave asked for or release an API it’s still a workaround if you want to do this. Time to break out my favorite http sniffer Fiddler and see if there is a way to get an RSS feed of all users commenting on a specific users data which is what Scoble wanted. Perhaps someone else will figure this out. 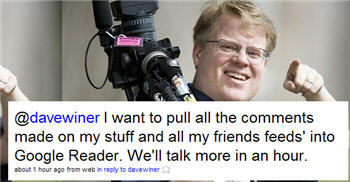 Just doing my job to make Scoble happy. Because wouldn’t that just make the world a better place? Louis, not that I know of yet since that isn’t data they are presently providing. All this hack does is provide a feed for data they already provide.